Transparency is often an attractive buzzword for new administrations, but following through on open access has proven difficult. President Obama’s record on transparency and the federal Freedom of Information Act was less than stellar. In the opening months of his term, President Trump has shown a similar wariness in allowing private citizens to access public records. Activists are challenging this resistance on the streets and in the courts. For news, analysis, history & legal background read on. 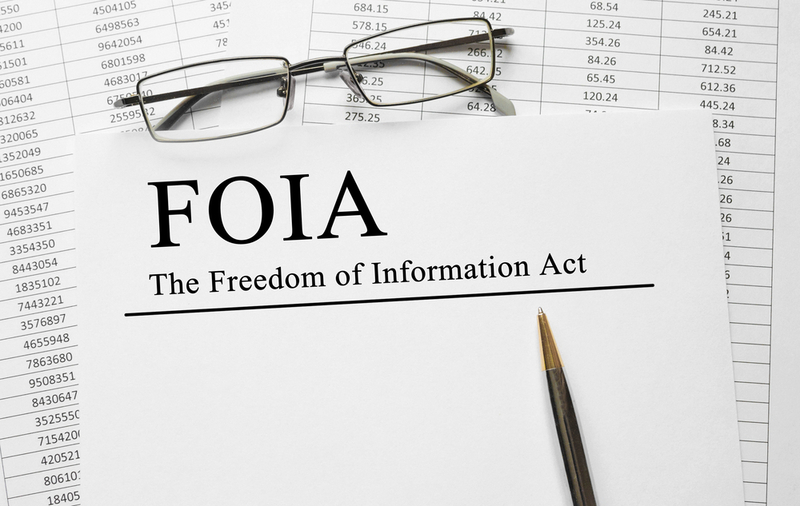 FOIA may be under assault, but it is still proving to be a most useful weapon to uncover the truth. The U.S. Secret Service says it has no tapes from the Trump White House in the face of WSJ FOIA. First reported by Buzzfeed, the chairman of the House Financial Services Committee, Rep Jeb Hensarling (R-Texas) told the Treasury Secretary Steve Mnuchin to exclude certain committee communications from FOIA requests. The AP later confirmed that Hensarling had issued the directive to a dozen government agencies, claiming the committee’s material was sensitive and confidential, and should not be made public. Congress exempted itself from FOIA when it passed the legislation in 1966. Despite criticism from transparency advocates and recently FOIA requests to compel disclosure, the White House has announced it will not voluntarily make White House visitor logs public, breaking with precedent established under President Obama. The decision means that visitor logs will not be made public until five years after Trump leaves office. As reported by Reuters, several watchdog groups filed a FOIA request to compel the Department of Homeland Security to release visitor logs at President Trump’s homes, including the White House, Trump Tower in Manhattan, and Mar-a-Lago in Palm Beach, Florida. The lawsuit followed repeated Democratic calls for disclosure of Trump’s Mar-a-Lago visitor logs. However, by many measures, Obama’s transparency promises went unfulfilled. As reported by the Associated Press in March 2015, the Obama administration set a new record for denying FOIA requests or for censoring information in the requests. In June 2016, Obama did sign a bipartisan bill designed to hasten the government’s responses to FOIA requests. The FOIA Improvement Act also codified the presumption of disclosure that Obama reinstated in 2009 (but which had little effect.) The bill also made it more difficult for the government to withhold select information that is more than 25 years old. After announcing that it would not publish visitor logs, the White House faced heated criticism from transparency advocates and defended its position. Sean Spicer cast doubt on just how transparent the Obama administration was, and claimed that the Trump administration was merely returning to pre-Obama practices. The criticism came not only from Democrats and government watchdog groups. President George W. Bush’s ethics lawyer, Richard Painter, told Politico, “ This is not a transparent White House. He’s nowhere as transparent as Obama because you don’t have the visitor log, you don’t have the president’s tax return—you don’t have a lot of information.” Painted also told Politico he thought Bush was more transparent than Trump because he did release his tax returns, even though he did not release visitor logs. Anders Aslund, a senior fellow at the Atlantic Council think tank, wrote an op-ed for the Huffington Post arguing for strengthening FOIA’s power and expanding its reach to allow for requests of full financial disclosure and presidential candidates’ business connections.